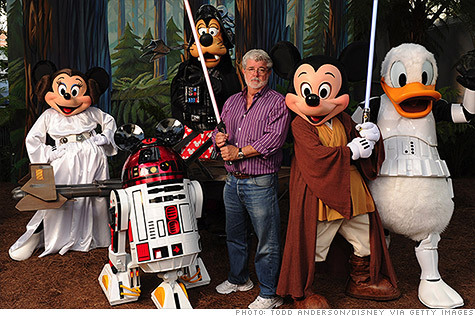 Announced on Tuesday, Walt Disney have officially bought Lucasfilm and the rights to continue the Star Wars saga. Although this may be exciting news, fans are concerned. Given that the ‘House of Mouse’ has never really done a science fiction film flawlessly it seems only right that fans of one of the most beloved and famous films of the genre are somewhat agitated. Disney’s ‘normal’ is predominantly fairy-tales, and although Star Wars is fictional personally I grew up believing every character was real. I loved the fact that there was no way in actually scientifically proving that in galaxy far away there wasn’t GunGans, Ivoks and Jedi Knights. Many fans fear that Disney will take away the realism in such characters as Luke Skywalker and Han Solo. Lucas’ inconsistency can hardly calm his avid fans; only in 2008 did he completely rule out any more series. This week he said: “For the past 35 years one of my greatest pleasures has been to see Star Wars passed from one generation to the next.” It now seems he wants his imaginative story told in whatever means, partly contradicting his original decision back in 2008. However even more recently he has stated “there will be no Episodes VII-IX”, meaning Disney should only be creating three more films. Even the announcement of ‘special editions’ of the original films in 1997 provoked some anger amongst fans as they pleaded the original material was fine the way it was. Episodes IV, V and VI were to incorporate new footage and have their old flaws corrected. Despite avid fans not liking the ‘special editions’, all three episodes performed strongly at the international box office creating a huge anticipation and new following for the next chapters in the saga. The Star Wars Prequels, tracing the early life of Darth Vader and how he ‘turned to the dark side’, were Lucas’ next projects to expand the Star Wars story. EpisodeI: Phantom Menace was released in 1999 and took the world by storm, despite concerns over character and an extensive use of special effects the film was titled ‘film of the year’. The casting of Hayden Christensen as the young Darth Vader in 2002’s Episode II: Attack of the Clones gave some followers reason to dispute, however he grew to be a good choice for most of the audience. 2005 brought a partial return to the original form of the Star Wars films with Episode VI: Revenge of the Sith. The majority of audiences were fairly content with the prequel episodes, but there were still those who saw the trilogy as a missed opportunity. But will the next three episodes share the same fateful view from avid vans, or will Mickey Mouse save the day? With only The Clone Wars animation to live up to since 2005 it seems Disney might bring something new and refreshing to a long loved story. The future of the Star Wars saga is now under the direction of acclaimed film producer and studio executive Kathleen Kennedy. Having produced E.T, the Jurassic Park franchise and the Indiana Jones films surely Lucas’ epic story is in safe hands? And who can question Disney’s success really? Their collaborations with Marvel brought one of 2012’s biggest hit The Avengers, and the uniting with Pixar brought the much loved Toy Story 3. Avid fans may have their doubts, but with Lucas’ amazingly created universe and brilliant story it also brings excitement as to what will come from one of the biggest film companies taking over.